It is that time of year when we think about giving special gifts to the people in our lives that mean the most to us. Your list might include teachers, neighbors, friends and co-workers. Gifts don’t have to be expensive, it is the thought behind the gesture that means the most to your friends and family. Whoever is on your list this year, think about using your kitchen as grand central for gift making. Gifts of food are heart felt and send a message that you spent time making something special that looks good and tastes yummy. These gifts say thank you in a thoughtful way. Don’t forget to include your kids in the process of cooking and assembling gifts to teach them something about budgeting and enjoying the simple pleasure of gift giving. The way the gift is presented can be just as important as the food itself. Try to pair up containers with the food gift that will be used after the food is gone. This can be a gift that keeps on giving. Examples are a decorative plate filled with cookies, pie plate filled with your favorite pie or a trifle bowl filled with goodies. You get the idea. Another thought is to put together items that say “sit and take a break” like a loaf of quick bread paired with a pound of coffee, homemade salsa with chips and a favorite beverage. The main goal is to show that you put thought in the gift and spent time preparing the presentation. With everyone watching their budgets this year, plan ahead to get the creative juices working by purchasing ingredients on sale and found locally. Local products in December include pecans, sweet potatoes, honey, peanuts, persimmons, satsumas and jams and jellies sold at local farmers markets. So get going and unleash your creativity, and give a few gifts from your kitchen and your heart. Have fun making these gifts, and remember to enjoy the process. One of my favorite festive cookie is the Chocolate Crinkle. The crackle on top with the chocolate and white sugar says it is holiday time. These cookies make a good food gift as they stay firm and will last up to a week. They also freeze well if you need to make ahead of time. Package the gift by placing on a nice festive plate and wrap with clear wrap and decorate with ribbon. Cream together the shortening, sugar and vanilla. Beat in the two eggs then add the melted chocolate. In another bowl, sift together the flour, baking powder and salt. Add flour mixture slowly to creamed mixture alternating with the milk until thoroughly blended. Stir in walnuts. Chill for 3 hours. Form in 1 – inch balls and roll in confectioners’ sugar. Place on greased cookie sheet 2 to 3 inches apart. Bake in moderate oven at 350 degrees for 15 minutes. Cool slightly then remove from pan. Makes 48. They are now ready to put in a container and give to friends. This cookie freezes well. 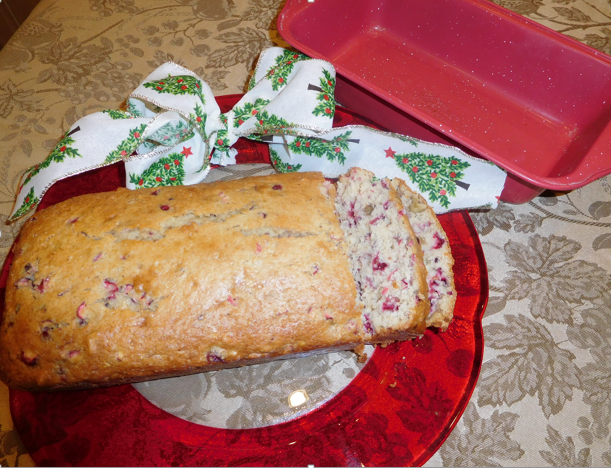 Prepare this nut bread then decorate with wrapping and ribbon. You might include the loaf pan as part of the gift. Include a brick of cream cheese along with a decorative butter knife for a complete package. Preheat oven to 350 degrees. Grease a 9 x 5-inch loaf pan. Mix together flour, sugar, baking powder, salt and baking soda in a medium mixing bowl. Stir in orange juice, orange peel, shortening and egg and vanilla. Mix until well blended. Stir in cranberries and nuts. Spread evenly in loaf pan. Bake for 55 minutes or until a toothpick inserted in the center comes out clean. Cool on a rack for 15 minutes. Remove from pan; cool completely. Makes 1 loaf (16 slices). Bake loaf in decorative pan as part of the gift. Make sure you cool after cooking then replace in pan and wrap as part of the gift. Use local sweet potatoes to promote locally grown produce. After baking, cool then give as a gift in a nice pie plate. Wrap, refrigerate with instructions on reheating for serving. For added effect, bundle with whipped cream and pie knife. Prepare your sweet potatoes for the pie mix. Select 6 – 7 large sweet potatoes and cut in half or quarters. Boil potatoes slowly for about 30 minutes. Let cool. Peel potatoes after they cool. The peel should come off very easy. Measure six cups of sweet potato in a mixing bowl. Use a stand mixer to beat the sweet potatoes and do not scrape off any mixture from beaters. This will contain the stringy part and you do not want it in your pie. Discard the strings. Mix all ingredients in a stand mixer until well blended. The mixture should be smooth and free of lumps. The mixture will keep in the refrigerator up to a week and may be frozen for future use. Be sure to label with date and amount before placing in freezer. Place mixture in unbaked pie shell and smooth to the edges. You will need about 2 ½ cups for each 9 inch deep dish pie shell. Mini tart shells may also be used for individual pies. This recipe makes about 3 pies or 12 individual mini pie tarts. Cook at 350 degrees until puffed and browned slightly on top. About 40 minutes.